As we age, our bones become more brittle and we lose muscle. But we can slow that down - and even reverse some of those effects - with yoga. 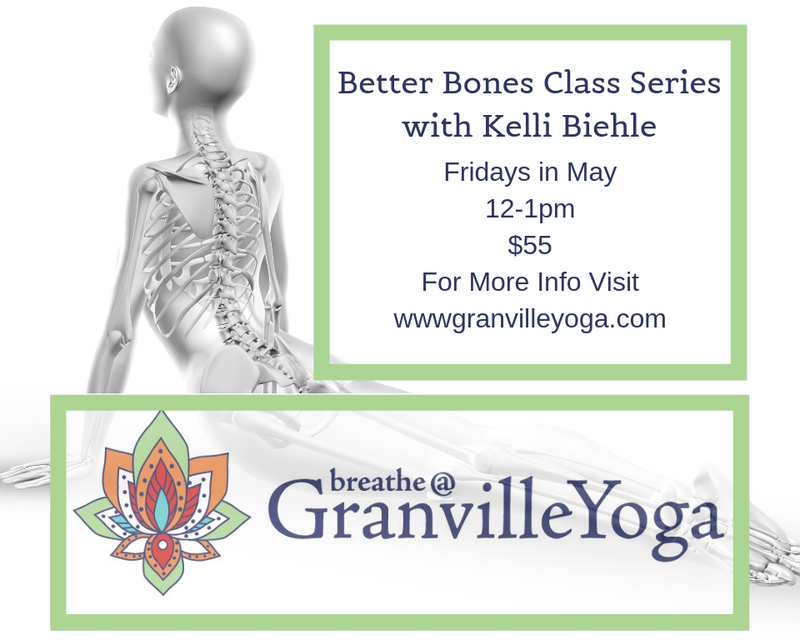 Join Kelli to learn how to use yoga postures to strengthen your bones, build muscle, and improve posture and balance. 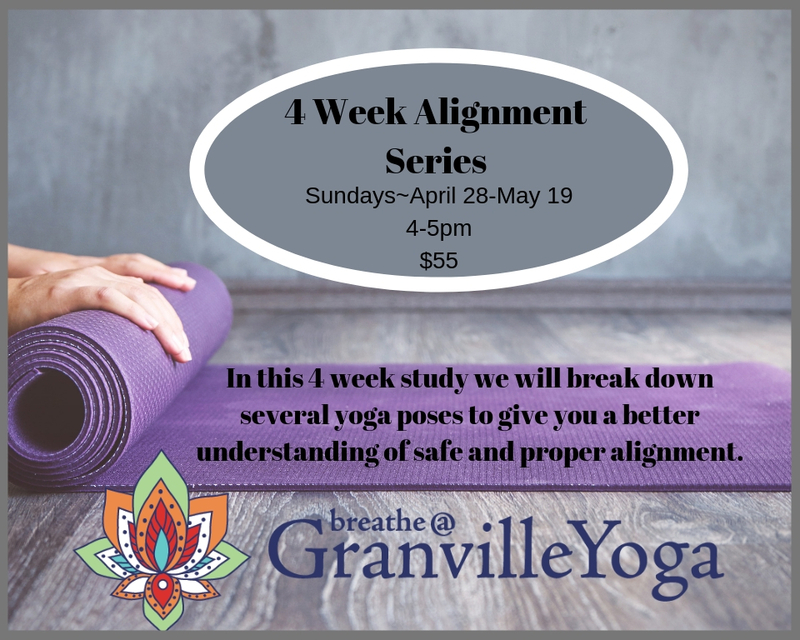 In this 4 week vinyasa alignment series class, we'll break down several yoga poses (asanas) in order to give you a better understanding of safe, proper alignment. Vinyasa classes often move quickly from pose to pose, leaving practitioners wondering if they are holding their bodies in space properly in each pose. 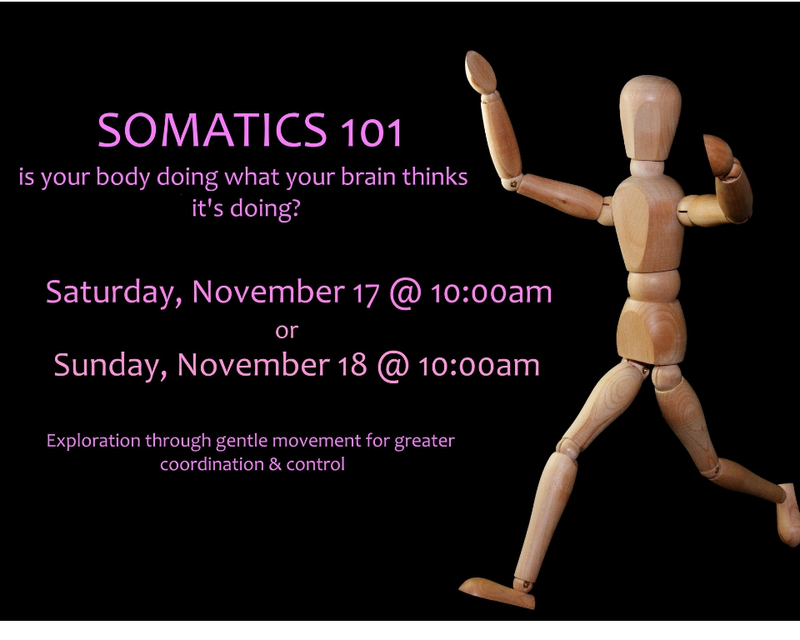 This class will offer that focus on that alignment knowledge, using an embodied practice to learn. Warrior 1, 2, and 3, side angle, triangle, chatturanga dandasana, plank, upward dog, downward dog, cobra, tree pose, lunges, bridge (perhaps moving in the direction of full wheel) are just to name a few of the poses we'll focus on in order to gain a deeper understanding of how to hold our bodies. This series is perfect for new beginners, those relatively new to vinyasa classes who are unsure if they are doing the poses properly, or even for those longer-practicing yogis who would like to get back to basics and practice their alignment. Your girls will love this fun filled class with Karen Scott! This time of year can bring up a lot for those of us that have lost our moms. Whether it was years ago or weeks ago, your mom or a mother-like figure, from illness or age, a long-time coming or sudden… it hurts us in profound ways. And the onslaught of advertising and social media posts like “bring mom for brunch” to “#blessed to spend Mother’s Day with my best friend and mom”… it can feel like too much to endure. I feel you, and I want to celebrate our mamas together. Join me for a gentle yoga practice (no yoga experience necessary), a little journaling, and treasured time together with women that truly know how you feel. I am not alone, you are not alone, we are not alone. Ayurveda Foundations: learn the ancient holistic healing practices of Ayurveda in this 4 week series. This sister science to yoga uses practical lifestyle and nutrition tools in order to bring the body into optimal health. It uses self-care practices and routines, diet, 5-sense therapies, herbalism, yoga/meditation/pranayama, all geared toward the unique constitution of the individual, aligned with the rhythm of nature and the 5 elements (earth, water, fire, air, ether). Learn how to incorporate these practices into your daily life to improve your health and well-being! Join Ayurveda practitioner and yoga teacher, Jodie Hlavachek, for this interactive workshop to learn Ayurvedic practices to help balance the Kapha dosha this Spring. We will discuss ancient holistic health practices to bring balance to the body and mind during Kapha season, which is dominated by the elements of earth and water. Price includes a yoga practice, pranayama, meditation, education on Kapha season nutrition, allergen clearing, cleansing, and 5 sense therapies, a take home gift and more! Join Kate White for this informative and fun workshop! Join Ayurvedic practitioner and yoga teacher Jodie Hlavachek for an experiential workshop where you will learn to make herbal tea blends specifically designed to reduce Kapha Season (Spring) imbalances. This will include making and drinking tea formulas to boost immunities, reduce coughs and allergy symptoms, as well as, improve digestion and metabolism. Workshop includes intro to the ancient holistic health system of Ayurveda and herbalism, hands-on herbal formula instruction and take home recipes, herbal tea blends to make during class and then bring home with you, as well as, the sensory experience of drinking different herbal tea blends together during class! Back by popular request! Mom and Son Yoga with Karen Scott! Learn healthy Ayurvedic self-care practices to reduce anxiety and promote restful sleep. According to the the ancient holistic healing system of Ayurveda, Fall and early Winter in Ohio are dominated by the elements air and ether, which have qualities of dry, cold, mobile, flowing and subtle. Everything is in flux and in constant motion, including our minds! This means that for many people, anxiety is at a maximum and sleeping through the night becomes more difficult this time of year. In this workshop, we will discuss and practice some tips and tricks to promote more restful sleep and reduce anxiety in the body and mind, in the spirit of the ancient wisdom of Ayurveda. Join Jodie for this workshop on February 10th. Jodie is planning many Ayurvedic workshops for 2019! Join Karen Scott for Mom and Daughter Yoga ~ Heart Full of Wishes! Join Jodie in her Intro workshop. Remember, this is offered 2 times this winter. Be sure to check out her other workshops too! Ayurveda is a holistic system of healing that originated over 5000 years ago in India and is still practiced there today. This sister science to yoga, literally translated as the 'science of life' provides practical tools, using lifestyle and dietary practices as medicine, to bring us to our optimal state of health and wellbeing. Taking into account that each individual person is unique, each treatment plan designed is specific to that person's unique constitution. A holistic approach to healing, Ayurveda treats mind, body and spirit to bring each person back to her natural state of balance and ease. 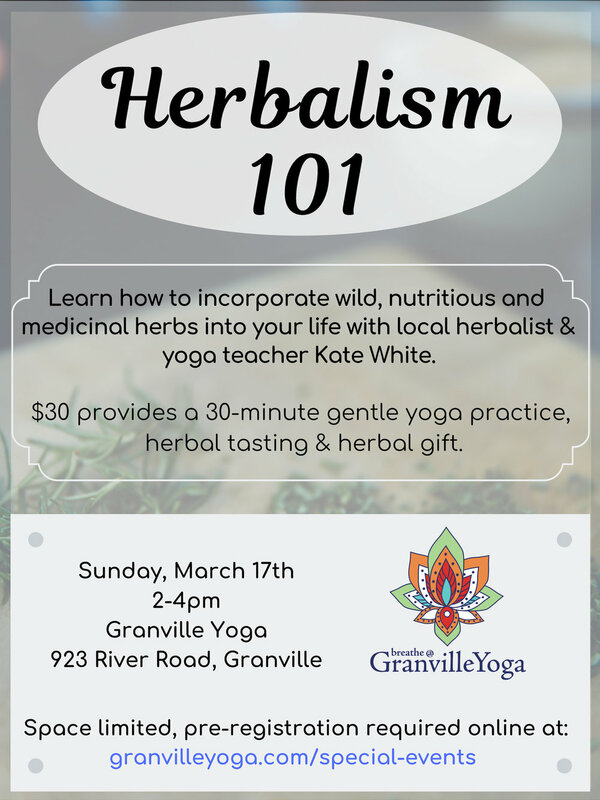 In this workshop, you will gain knowledge and insight into the wisdom of this ancient health system and some of its practices, an introduction to herbalism and making herbal formulas, and will learn how to make solar-infused herbal oils to take home with you! In this hands-on experiential workshop, you will learn how to formulate herbal blends to infuse into oils that have specific healing actions on the body. Using the sun to infuse the active compounds of the herbs to create a medicated oil, the oil can then be used for a multitude of purposes – self-oil massage, cooking, or to make lips balms or salves for skin care! Many of our instructors are offering this PRIVATE CLASS SALE. Speak to your instructor today about this great offer! A Great Time Of Year To Learn Techniques To Reduce Our Stress. We will practice gentle Yoga with breath work and learn the history of mala beads. Everyone will leave with a beautiful mala necklace, made by YOU! We need to ask for a NOVEMBER 20th DEADLINE FOR ENROLLMENT…we need to order our bead kits. These kits are beautiful, you may want to order an extra kit for holiday gift giving. Cost of our workshop is $50. Cost of an extra kit is $45. After enrolling for the class, please email Kim Downs at kim@granvilleyoga.com and let her know that you will be purchasing an extra mala beading kit. 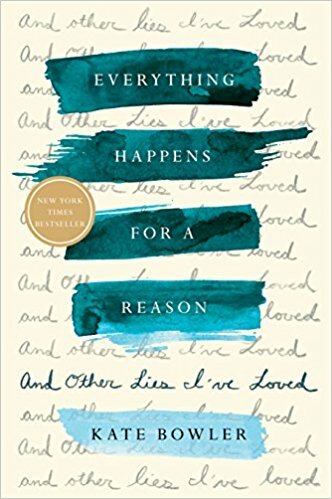 The award winning NYT bestseller about the extraordinary things that can happen when we harness the power of both the brain and the heart. Two Book Club Dates To Choose From! Mom And Son Yoga- This Sunday! Learn to use yoga postures to strengthen your bones, build muscle, and improve posture and balance. As we age, our bones become more brittle and we lose muscle. But we can slow that down and even reverse some of those effects, with yoga. 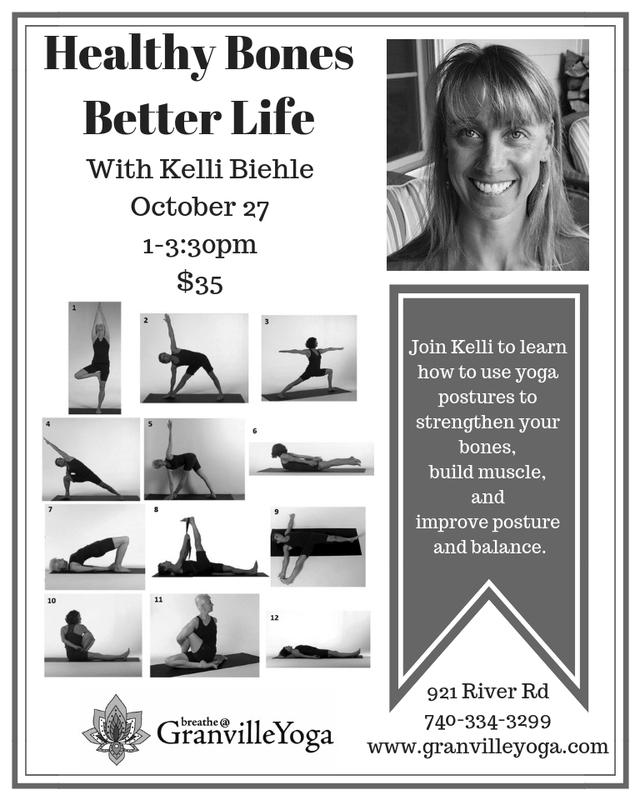 Join Kelli to learn how to use yoga postures to strengthen your bones, build muscle, and improve posture and balance. We will be specifically using concepts and poses researched by Loren Fishman, MD. This research has been published in books, online and in various news outlets. Kelli attended training with Dr. Fishman last summer and is eager to share her knowledge with our community. The definitions and effects of osteoporosis and frailty syndrome. Briefly examine the science behind how yoga acts as preventative medicine. Learn two sequences of yoga postures you can do at home to build bone and muscle strength. Learn how to adapt postures in any class to build bone and muscle strength. This workshop is perfect for anyone 50+ years and anyone is concerned about having to go on medication to prevent osteoporosis. 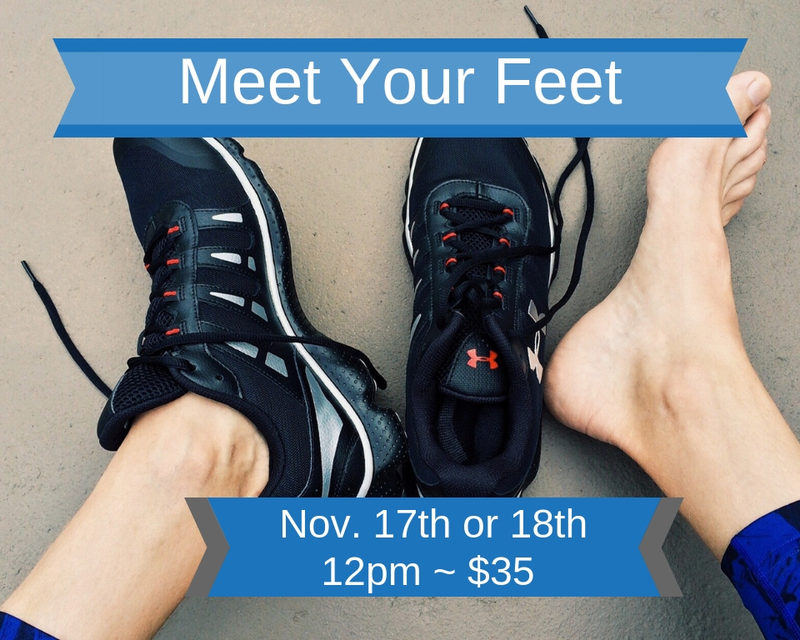 If you ever worry about falling and breaking a bone as you age or are looking to maintain your mobility as long as possible, this workshop is perfect for you. 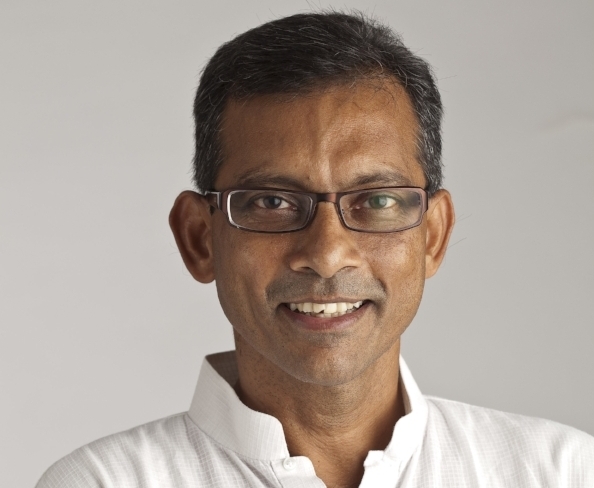 Join Sri Ravi Shankar to learn about our Koshas; layers that include the physical, energetic, mental & emotional, higher intelligence and our bliss bodies. With the focus on the breath and connecting breath to movement, walk away from this class feeling calm and rested and ready to begin your day. 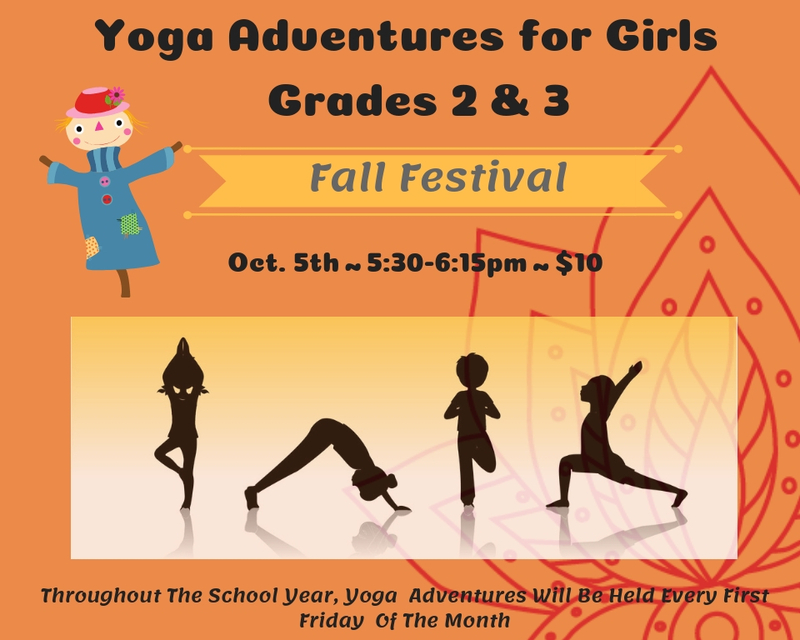 Yoga Adventures is for girls in grades 2 and 3. This class is offered throughout the school year and is taught by Karen Scott. Yoga Adventures is held every first Friday of the month. Join Karen for the first Yoga Adventures Class of this school year. You will celebrate BACK TO SCHOOL by exploring math, science, and geography in yoga poses! Presence: Bringing Your Boldest Self to Your Biggest Challenges" Amy Cuddy"
Amy Cuddy had one of the top ranking TED talk installments when she presented her research on 'power posing". This book will give you the tools to bring your best self forward. Cuddy explores the concept of presence, she defines this as, "the state of being attuned to and able to comfortably express our true thoughts, feelings, values and potential". Of course, there is no fee for this but please RSVP. Join us in discussing this acclaimed book. 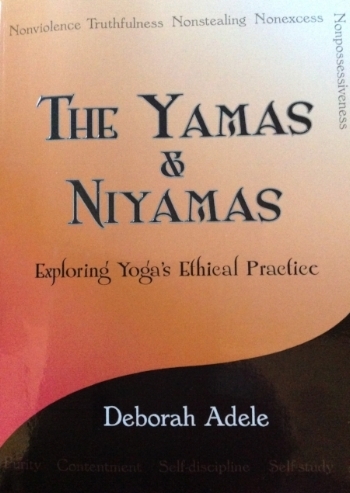 "The Yamas and Niyamas" by Deborah Adele, is the topic of discussion and action for the summer. From Christy's class notes, " Yamas and Niyamas remind us to step back and remember to connect with what is really important. In this way, we shape our lives, with purpose." From the author, Deborah Adele, "I often think of them (yamas and niyamas) as jewels, because they are rare gems of wisdom that give us direction to a well lived and joyful life." Each week we will embrace a yama or niyama, so get your copy today and join us! Join us for Girl Time Yoga - this special class is meant for girls in grades 7-8. 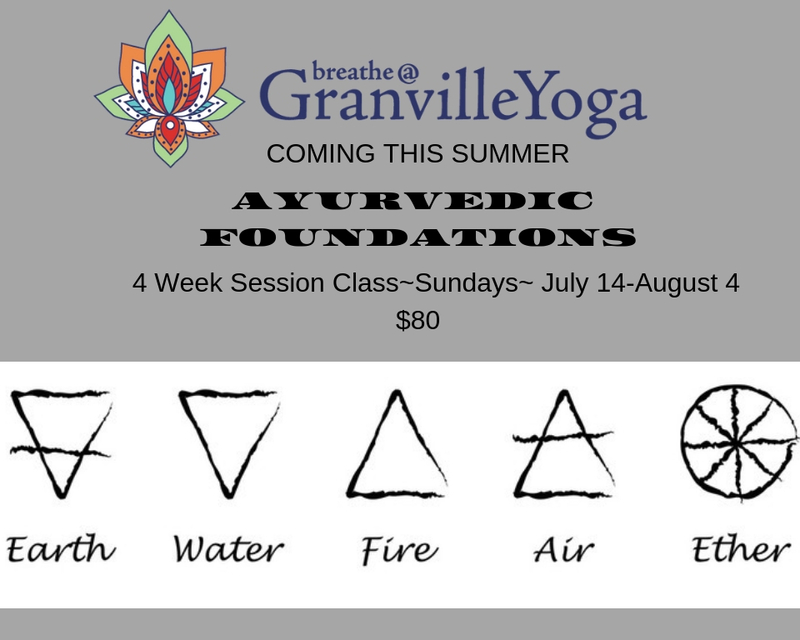 The class runs from 5:30pm-6:30pm at Granville Yoga. 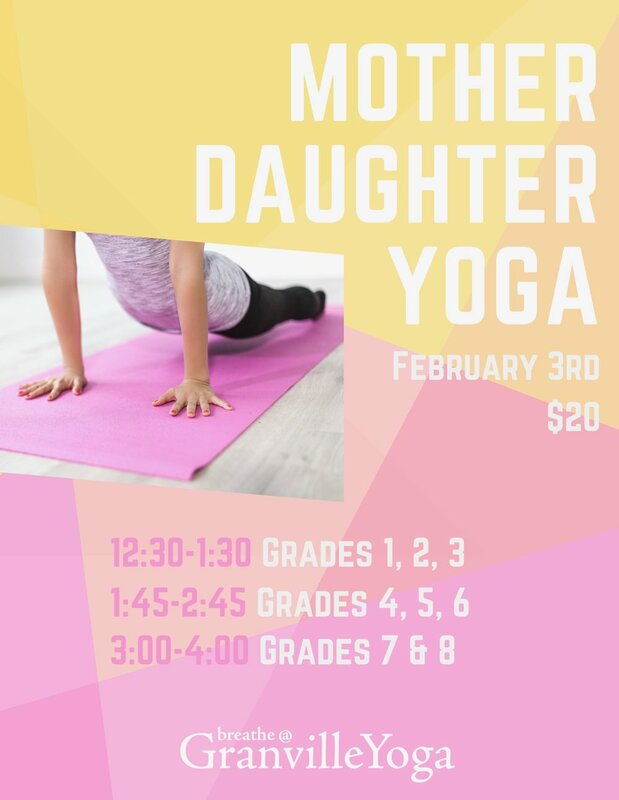 Join us for Girl Time Yoga - this special class is meant for girls in grades 4-6. The class runs from 5:30pm-6:15pm at Granville Yoga.